I can hardly believe that is was six months ago that I created a batch of 20 niche sites in August 2011. I have been disclosing the earnings, rankings, and much more on these sites for the past few months. You can see the earnings after 90 days here and 120 days here. In addition, it has been just a little under six months ago that I created my Authority site. If you need a refresher on my Authority Site Project, you can read about it here. Now before I dive into this income report, I want to stress 2 things. First, the earnings from these 6 month old sites is not typical. I have created several sites since this August batch, and while they do earn a decent amount, its no where close to what these sites have done. So, that is the first point I wanted to stress: These are not typical for small niche sites! However, this is what is possible. Just to give you an idea of how atypical these site are; I usually try to shoot for a $1/day (each) on average for my small niche sites; my average across all my sites is closer to $2/day. However, these sites are averaging almost $4/day (each)! That's twice as much as I usually get across all my sites as a whole. Second, I want to stress that I had created over 200 sites before I created these, and those sites still make me a decent income every month. I have also created many sites after these 20 sites, and those sites are also earning money. So, I just want to be clear that these are NOT the only sites I own…they are just sites that I have been tracking publicly on the blog here for 6 months. How Did I Create These 20 Sites? To give a quick review of how I created these sites, I wanted to mention a few things. To find the keywords that I used to base these sites on, I used Long Tail Pro (my keyword research tool). I used some of these methods to generate seed keywords as I discussed here. Then I analyzed the top 10 results in Google to determine which of those keywords were low competition. I have harped on this over and over again, but the only way to tell the true competition for a keyword is to analyze the top 10 results in Google! Title competition, number of competing pages, red or green lights, will NOT tell you if its a good keyword is. If you want to know exactly step by step how I analyze the top 10 Google results, then you should read or re-read this post on analyzing the competition. I outsourced content via TextBroker.com. Then I used a couple of different article/blog networks to build links. I used MyArticleNetwork.com to get some links, and then I also used Unique Article Wizard to get additional links. You can read my EXACT step by step guidelines for how I built links to these sites: Ultimate Backlinking Strategy for Niche Sites. That is essentially everything I have done to the sites. I have not touched most of the sites since I created them (the exception is site #1 below which I've added new content to). As you can see from the image above, these sites brought in a whopping $2,305.02 in the month of January via Google Adsense! So, six months after I created these sites, they are still earning good money, and its all passive at this point. After initially building them and completing my typical link building for the sites, I have not really touched them. For site #1, I have added additional content and I have started a second link building campaign. There is about 25 articles on site #1 now. 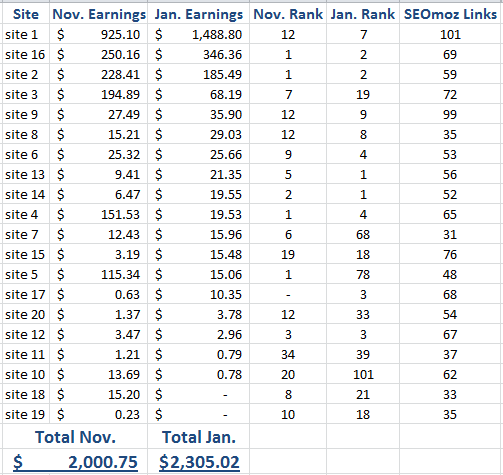 You will notice that the sites are ranked by January earnings. The sites were assigned a number in my first income report on these sites, so I have left the site numbers the same and re-ordered them based on January earnings. So, site #16 for example is the same site#16 from the income report 3 months ago. Yes, I know that site #1 is bringing in the majority of the income. This is part of my niche website strategy. Build lots of sites and find the big winners; read my post here about this. However, even without site #1 these sites are profitable. I have spent probably right around $2,000 creating these sites, building links to them, paying my Virtual Assistant, etc. However, since creation I have easily over quadrupled my money on that $2,000 investment. So, even if the sites fell off the face of the Earth tomorrow, it still has been an excellent investment. In reality I expect at least the top half of these sites to be around for a few years (if I don't sell them first) only increasing my Return on Investment. The second part of this report is dedicated to my Authority Site Project that I also began roughly six months ago. You can read about the ups and downs of the Authority Site Project here. Obviously, the earnings of $130.65 is a bit disappointing considering that I made over $200 from the site last month. The site is also lower in rank. This month has been VERY active as far as rankings is concerned. My site started out at 11, then I started building more links via Unique Article Wizard and Build My Rank. Then the site started to dance around. It jumped down to as low as the mid 30s, then bounced up to the first page for a day or 2 at #10, then dropped to the 3rd page, and then back up to the middle of the second page. So, its been all over the place this month. To be honest, I am getting very little traffic from my primary keyword. Although when it was on the first page for a day or 2, I definitely saw an increase for traffic from that keyword. However, the majority is coming from hundreds of different long tail keywords from all the content on my site. There are over 100 articles on the site and so I get search engine traffic for various keywords. Overall, this project is not turning out as well as I had hoped at this point, but the reality is that a site earning $130 a month is not bad at all! I haven't recouped my investment on this site yet, but I will if the site keeps earnings between $100 to $200 per month. But I still plan on working on the site, primarily through link building, and getting the rankings and earnings up. Overall, that is a quick snapshot of earnings from 2 of my projects: a batch of 20 sites built 6 months ago, and my Authority site. I've done my best to lay out what has happened with these sites, how I created them, and why they are earning money. Do you have any thoughts or comments that you would like to add to the discussion? If so, let me hear it below! Spencer, very inspiring indeed! Site#1 is a killer! But like you mentioned even without it, your average income from these sites is still great. It really shows what you talk about this business being a numbers game. Any chance that Google’s latest above the fold algorithm change might have affected your authority site? Spencer, another question. Wondering if you have any thoughts on why some sites lost quite a few ranks, eg: site 5 from # 1 to #78? Thanks Manyu! I considered that and its possible that its affected by the algorithm change. But I am purposely not changing my ad placements initially to see what happens to the ranks. If it doesn’t improve, I will then resort to changing ad layout. What size (and how many) Adsense ads you are placing on your websites? Those results are pretty unreal. Keyword research is the biggest factor in niche site success. Unfortunately 50 some sites did not benefit from that advice, but my more recent ones have. Its a hard lesson to learn – best of luck with the new sites! Site #1 is definitely killin it! Wow, you are killing it with that site #1! It’s also encouraging to see some of the sites ranking without a ton of backlinks. That all goes back to the importance of keyword selection and following a backlinking plan that works. All those resources you linked are very helpful! Best of luck with the authority site moving forward. You’re right: although it isn’t having as much success as you might have hoped, a site making over $100/month is never a bad thing! I’m sure it will only be getting better from here. Fantastic work Spencer! It really is inspiring to see how well you are doing with these sites. I appreciate that the results are not typical but I have always agreed with your assertion that it is a numbers game. I am currently building two niche sites a week so hope to start seein results soon. It is indeed a numbers game. Thanks Tom! Men you are killing with those sites!. 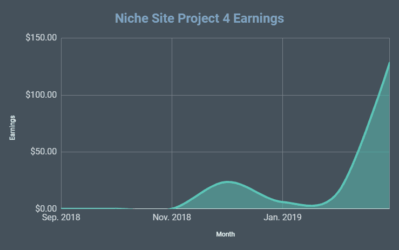 Well thats the price of testing and keep looking for new niches, there will be a time when you find something that is needed to dig deeper like you are doing on those 20 site. Amazing Spencer ! Your site #1 of those 20 is really the big money maker. My 70 + sites combined, do not earn as much as that #1 site. Getting close though ! A question or 2 about backlinks : What do you think of Traffic Kaboom And Authority Link Network as compared to UAW and BMR ? Also what do you think about creating buffer sites or link wheels on web 2.0 sites like Multiply and Posterous, then blasting them with xrumer or scrapebox links ? I am using a linkwheel gig on Fiverr, combined with another gig to blast them with thousands of backlinks and it seems to work well, for now anyway. I got a couple of new sites in the top 5 doing this recently. Have you experimented with this ? I am not familiar with Traffic Kaboom or Authority Link Network – so can’t compare. Link wheels can probably work pretty good – but I’ve never really used them. I’ve used BMR for 6 months and am testing Traffic Kaboom right now. I currently have mixed feelings about TK but haven’t really committed myself to using it enough for a fair assessment. My first article took about 2 hours to write and enter into TK. It averages about 750 words. I submitted it on 12/29 and it has been posted 24 times. I’m disappointed in the # of times it’s been posted, but writing 24 post for BMR would have taken me a lot longer that 2 hours. My second article was submitted on 1/12 and it has only been posted 7 times. I think that for very deep niche posts, BMR may be better as the help forum for TK has suggested write broader based articles. Just goes to show that I need to just make 20 and go with it instead of one here and there. Spencer, I’m diggin’ the table of data for your 20 sites from August. It’s interesting to see how the earnings have jumped up or down, along with the rank. Hope the rest of your projects did awesome in January! Glad you like the table – getting all the data took a while! Just thought I would say hi and let you know I am still following your progress and checking in from time to time. Thanks for sharing all this great information. Chris – thanks for checking in! Glad to see you are still around…you are definitely one of my first blog readers…thanks! Honestly I am not sure the exact number. But its around 300 total sites that I’ve created. Perhaps a little more, but that’s close. Great results as always Spencer! And I admire your patience, something I definitely have to improve upon. But the good news is that after 1 month I earned a tiny bit of money from Adsense. I can only imagine that six months from now I’ll be able to enjoy looking at an income spreadsheet like yours! Sorry to hear about the blip with the authority site. I’ve seen two of my Amazon authority sites start to take a serious turn for the better (with 1 finally hitting #1 for its main keyword). Slowly building out more content on that to turn it into a heavy hitter. Keep up with that authority site though man. Slow and steady will win the race. You never know what can change and work in your favor a few months down the road, either – one small shift could turn that into a HUGE winner! Nice – about a $1,000 in earnings a month is GREAT! Just means you know what you are doing at this point – just need to grow your sites or create new ones to increase your income. Hi Spencer, thank you for sharing this. I’ve recently subscribed to your site and am trying to learn as much as possible. A quick question, how much should I expect to spend to set up one site? Tiffany – that all depends on how big you make your site and how much linkbuilding or other promotional dollars you want to spend. However, for a site with 5 articles you should expect to spend around $80 per site. This would include linkbuilding expenses as well. Hi, Spencer. Awesome results for 6 months. Question: Other than the authority site have you done anymore link building with any of your sites since last year? I have not done any additional link building for the 20 sites that I recall. Whats Your average cost per site? and how much would be to much when starting a niche site? So far after starting my first site with 5 articles, I’ve spent about $105.00 with 90% being the cost of content. Do you try and stay under a certain figure when you build your sites?. Spencer answered that 2 or 3 posts above ($80) is what he expects to spend including link building…. I was wonderinf if you would mind breaking the $80 down for us though? $20 to $30 for linkbuilding (pays for my VA and subscriptions). That is a total of anywhere from $77.50 to $90. Also, many of these sites started with less content, so you can knock off $20 on some of these. So, many of my sites are build for a cost of closer to $50. I think a good range is anywhere from $50 to $150 for a small niche site – just depending on how much you outsource, how big the site is, etc. That price also factors in your spreading the cost of subscriptions and your VA across multiple site builds I assume? For somebody build 1-5 at a time those cost would be naturally higher as you suggest taking the potential cost upto near the $150 mark. Yes, that is correct. Because I have more sites, I can spread the cost of not only VA, but hosting, linkbuilding subscriptions etc. If someone is only building a few sites, the per site cost will indeed be more. Yes, I definitely agree that the prices should range based off how much you outsource and how much work you do yourself. I do think having others do the work for you does return faster results, but those starting out may not have that kind of money up front. 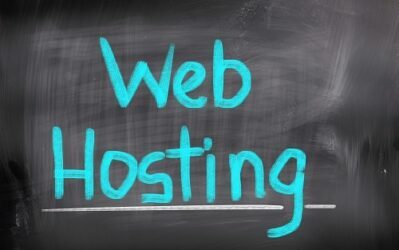 One thing you left out and that I have been questioning…is how much are you paying per site on webhosting? Im starting to think $10/month webhosting per site on top of the other cost can get expensive, especially in the first few months when there is not enough adsense earnings to justify.. is there a way around paying $10/month per site? If you are paying $10/mth per site for hosting you are paying way too much! On ONE hosting account, you can have up to 100 sites! I usually would put a maximum of 30 to 50 on 1 hosting account. In addition, hosting is closer to $6 or $7 per month. So, if you have 100 sites on one hosting account – that’s just $0.06 per month for hosting a site. Hosting is really not that expensive. I mentioned that $80 is probably close to an average for my sites. Although sometimes I spend much less if I only add 1 article to start. Or sometimes its more for bigger sites. You know it’s really amazing to me to think that this group of sites could be at $50,000 annual revenue plus…by the 1 year mark. It takes people a lifetime of hard work and savings via traditional methods (401ks, savings, etc) to reach this amount of savings in a best case scenario while generating a MUCH lower income on 500k. Its blows my mind everyday! Although, Im not sure they could be bringing in $50k annually. They are making $2300 a month now, that would be $27,600 annually. Also, a conservative estimate for what the sites could be sold for is 10-15 times MONTHLY earnings, not annual earnings. So, if the sites sold for 15x earnings – that would be $34,500. A nice chunk of change but far from the $500k you projected. Just wanted to clear up the math a bit. But still not too bad for only 1 months worth of sites! Ah ok, my oversight. I am used to hearing multiples quoted annual, but you’re right…is monthly. Still a great way for anyone to supplement retirement while working in a field of interest! I’m trying this on a smaller scale but I’m nowhere near what you are making on your sites. Also they are not adsense sites, maybe that’s the reason. I would love a little insight as I refine my strategies. Have 16 sites up in the past few weeks and am starting to earn a bit ($2-3 a day). But the majority of the sites have received no link building efforts at all. All of the sites only got UAW and MAN. EXCEPT for the #1 site – just last month I started adding some BMR links to that one. See if I can get it to the top of page 1. Excellent info, as always, Spencer! So if all of the sites except for #1 got UAW and MAN — and you just started adding BMR links to #1 last month — does that mean #1 ONLY got BMR backlinks? And did you give it 101 BMR backlinks in a month? I’m wondering if the higher-quality PR backlinks that BMR provides is responsible for #1’s success — combined with the great keyword choice, of course. All sites got links from UAW and MAN including site #1. I added BMR links only because it was earning more and I wanted to push it higher in the ranks. Spencer, keep up this inspiring work and updates on your sites. I have the same strategy as you do. I build a bunch of sites, find a winner, and then build on that one. The other ones might not be complete losers, but sometimes you can find a diamond in the rough. Yep, its all about finding the diamonds! Best of luck Mike! 1.Are you willing to share any of the sites publicly? 1. No (too many people copy, clickbomb, or cause other issues that damage my business if I do that). 2. No (I prefer to build sites over coaching – one is passive, one is not). It would be an excellent teaching tool. But the reality is that I make much more from my niche sites than from this blog – so I need to protect the privacy of my sites. Once they go public, I will get LOADS of copy cats which could essentially destroy my business. Its not worth the risk to me. I used to not understand why and now it makes a lot more sense. One person going wild via click bombing can cause more risks than its worth. I’ve shown a few friends my niche sites and always tell them over and over not to click the ads. Lana, you may want to check out Ad Sense Flippers. I believe Justin still makes a couple of his sites public. Nice Spencer, Thanks for keeping us updated on your progress and success! Great post as always followed by a number of good questions asked by your community here..
I’ve got a couple questions about your 20-site portfolio. The first is, do you plan to try to rerank the sites that dropped substantially in earnings/rankings? Specifically I am talking about 3, 4, and 5. Will you try to revive them? Second: what is the average exact local searches for the primary keywords for these sites? I know your Longtail Handbook said you aim for at least 1000 exact match (2500+ preferred), were these measurably higher? Final question: How long does it typically take for your ranking efforts to bring in success? I know this is sort of an ambiguous question because all sites will ebb and flow in rankings. But say you create 20 quality backlinks over 1 week, how long do you give those links before you know if they were successful in boosting what you believe to be a well-researched site? I broke down all the search volumes that each of the keywords gets. Awesome report on your 6 month old sites! I was wondering what software you use to track your niche sites rankings. I have been trying a few different programs but would love to hear your opinion on what’s best. I have used the free plugin for Firefox called Rank Checker, I’ve used it for years. But Long Tail Pro actually includes a rank checker as part of the software as well – so I can check ranks there now as well. Man! That is GREAT! I am so glad to see you are doing well with all your niche websites. That is really a direction that I am looking to try out soon. I guess I have a number of niche websites, but they were more like blogs with tons of different products and services. I like the idea of creating niche websites on very targeted keywords and just use amazon and adsense for the most part. I think this is a excellent post once again. And it shows the real work behind building sustainable adsense niche sites. Personally myself I build about 10 sites in Dec there starting to mature but I get discouraged when I don’t see results I hoped. This posts show me/us all that it takes time and money to grow these sites. Importantly when I get down because my adsense didn’t make as much as I wanted for that day, I just come back and read your posts and know it’s achieveable.This blog is a so valuable to our community. Thanks Spencer keep up the good work and great posts. Spencer, great results as always! Is it possible to find high traffic keywords above 10,000 exact match search volume but with very low organic competition? I believe that there’s a number of a new keywords that it’s created every day, if so how can we spot them? Since Facebook wants to raise $5 billion in an IPO that looks likely to be the largest by a web company since Google in 2004. How do you expect the growth of the online advertising business and the competition among Google and Facebook in this year 2012? Is there any plans to some offline projects? Thanks! Annie, it IS still possible to find low competition keywords with over 10k exact match searches. Its not necessarily easy – but there are lots out there. New keywords are created all the time, but I don’t necessarily target new trends, etc. Interesting question about facebook ads vs Google ads. Facebook has had advertising on their site for a long time, so I don’t think much will change as they are going public this year. They may grow, but I don’t think we will see a huge shift from Google to facebook this year. (there will still be LOTS of advertisers on Google). Hey spencer, I am one of your followers that is from Singapore. I believe you don’t coach. what about a private member forum? Is tt not passive? btw I hope u have plans to make a blog post that details into on content creation that perhaps into what type of article/content suits what type of niche. I am aware theres a Post on content but looking forward a detailed one.perhaps also a template or format that is close to your type of content u utilize. A private member forum is a good idea, but its certainly not passive. I would have to be heavily involved with it day to day answering questions. I’m not ready for that kind of commitment! Although maybe I should just turn this blog into a pay to view only membership site, huh? I spent lots of time answering questions for free! Pip, I have to admit that my Amazon sites have taken a back burner. I have added the content and started building some links, but I have even yet to add my amazon affiliate links. Its takes a bit more time than adsense to monetize with Amazon…but I will get around to it. So, I am working on getting the sites ranked and hopefully start getting some traffic. I will definitely be doing a post in the future with a better update on these sites though. Great post and congrats on the figures, pretty good for only 20 sites. Very motivational. Please keep sharing as you are the true authority on this. Outstanding result. If possible could you tell us about alexa rank for those sites. I just curious relation between serp ranking that drive trafffic and alexa. Alexa ranking is simply a traffic rank provided by a subset of browsers that use the Alexa toolbar. The toolbar tends to be used by fairly sophisticated users so is not representative of the majority. Your own traffic logs or Google Analytics are far more reliable for traffic measurement than Alexa for the purposes being discussed here. 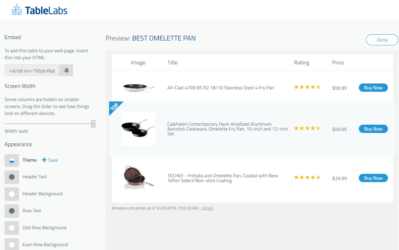 However, if you ever want to flip an adsense site, Alexa rank does seem to be taken into account by some buyers as part of their website evaluation. lol…that was a question I had too…what is the idea behind alexa anyway? My question, please answer do you keep working on article marketing to maintain ranking. regularly / occasionally? No. I essentially do what I listed in my Ultimate Backlinking post and thats it. I haven’t built any links to most of these sites for months. Great to see your income.Passive income month by month is really awesome. Apart from your first site and authority site,how many page content you build for other sites?Does other sites have 5 page content and looks typical MFA sites ? Most of them are anywhere from 1 to 5 pages of content. The top site is 25 or so. hi spencer…im just curious if you host these sites in just one hosting company. do you also host them on differnt ip addresses like what i read in the forum ? is that the advisable thing to do if you have tons of sites already? Most of them are with the same host; however, the hosting account is really like 10 different accounts with 10 different ip addresses. Awesome results, thanks for sharing! I was wondering if you’d write about your business modell future posts maybe? (As in how do you distribute your sites across your servers, how many sites do you put under one Adsense account, etc). If you don’t mind sharing, are those 20 sites targeting more of “product” keywords or “information” keywords? Once again loads of valuable data and insights. I was listening to a podcast the other day by the adsenseflipper guys about the open free model. You deserve a lot of credit for giving us all this information and so helpful to people starting out. For us someway down the line the fact your prepare to share so much for FREE is brilliant and you deserve all your success. The paid learning model tend to end up being a stuck format the same way Trent Dyrsmid charges a huge fee for information we get here for Free. Thanks for helping everybody out Spencer I get lots of people (in my outsource business) telling me they got started through your site. With your UAW distributions etc have you documented that process anywhere I could not see anything other than you use the service? Thanks for picking up a copy of Long Tail Pro! I was just wondering if you look at the bounce rate of your sites. I have heard that a high bounce rate can negatively affect a website’s ranking in the search results. But I am unsure what a “good” bounce rate would be. Can you share your sites average bounce rate (and if you even think it matters)? BTW, due to your strategies I have been consistently paid by Adsense since October 2011. Thanks! Great post thanks spencer. Just wondering about the 15 of the 20 sites not making your goal of $1 per day. As a newbie that is my goal too but I’m wondering if 75% of the sites spencer builds don’t make $1 per day…..should I, as a newbie not as good as spencer, have a different lower goal? 2. Love long tail pro (I use). A suggestion i would make on the rank checker. Allow us to check on one keyword at a time. If you run the report and the. Add a few additional the. You have to run all of them over again when you may only want to run a few. Just a thought that might help keep down the checker searches that are performed. Keep up the info. I would be interested To see you run a similar earnings on a group that you see more likely to obtain to give us newbies a realistic look on what we might see. Great report! How are you find BMR which you are using on your authority site? Are you tempted to use it on your smaller niches sites? Thanks very much for providing your earnings data again, this is very motivational to me. Can you please tell me if Long-Tail Pro is suffering from any of the problems that have been affecting Market Samurai of late? No,Long Tail Pro is still functioning as before and as shown in the demo videos. I have a question : could you give us the typical message you write on textbroker.com to ask for niche articles ? How do you make sure that the person writing the articles will meet your requirements ? I am not Spencer obviously, but I can help you a little with this. I have never used textbroker to order articles, but I have hired writers through Freelancer.com which is a bidding site and you work with the writers directly. When I would post jobs, I am specific because it seems many people are new to the internet world and may not understand that writing for the web is different than writing for an English report. please use the primary keyword 3x-once in the first paragraph(preferably in the first sentence), once in the body, and once in the conclusion. please use the secondary keyword at least once in the article. This really makes it easier for the writer to know exactly what you want and you should get it back this way. If not, you can always requests a rewrite with corrections. Also, let them know if you want informational content, review content, personal content, or bullets/lists or anything else you may be looking for. Hope this helps. I did not know all this starting out, and it took a while to figure out the communication part and how specific you really have to be without holding their hand or standing over their shoulder. It’s an awesome to see you have some sites making hundreds and even thousand! Thank you for your inspiration and I plan to build 8 sites this month. Need to focus and execute my daily schedule. Hopefully, I will have a winner in a few months. It’s totally a number game! Thanks for posting these reports Spencer! Lets me know that IM is still alive and kicking for all to pursuit. Thanks for sharing your update. Wondered though, you put a lot of time and effort into your sites. Do you ever worry about having majority of your traffic depend on Google? I have had some niche sites that did okay but then after a few of the updates the income fell off. The only thing I can think of is some of the link building or article submissions that I did a few years back were no longer viewed as “quality” links by Google. So since then I have tried to incorporate list building with my niche sites. If Google is going to drop my rankings and diminish some of my revenue at least I can market and promote to my list. So your thoughts on relying heavily on Google for most of your niche sites. Great work btw! Yes! That is why I started this blog NichePursuits.com, because I was worried about my business relying on Google. So, the initial reason I created this blog is to discuss business ventures outside of niche sites. My first venture is building an iphone app which you can read about here: https://www.nichepursuits.com/category/mobile-phone-apps/. 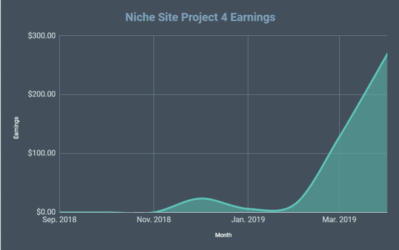 I still primarily discuss niche sites on the blog because a significant portion of my income is still derived from there and I continue to build my niche site portfolio. What is the url of site no. 1??? I would like to see an example of your niche websites. Hey, Chris, I might be wrong, but I doubt Spencer will give that to us and I wouldn’t blame him one bit. Having a lot of traffic from his readers who will visit his site, but won’t act as normal visitors would, will skew his analytics. Unfortunately, a lot of people will rip him off by copying what he does. I’ve seen this happen with other mentors I have followed. I’m no mentor, but I’ve had people unapologetically steal content from my sites. Most mentors have had this experience and only give out the url of sites they no longer care about. Exactly. You nailed it Dee! You stated all these sites in the same month, How do you go t about managing the seo for all 20 sites at one time?. Spencer, you are living (my) the dream already. This is what I am projecting at and I am pretty sure i will get there one day without waiting or looking back at all. Thanks for posting this and wish you much more success. I guess the authority site will soon take a dramatic change for good if you continue to build links slow and steady and add more contents! I’m glad i found this income report because sometimes I feel like I’m working towards an invisible goal with my Niche site efforts. At least by going through your info I can sort of get a feel for if I’m going in the right direction. Thanks Spencer, great stuff as always! I’d be very interested to know what the rough income distribution for site 1 is between the 25 articles, and what kind of traffic it gets. I’m building a lot of sites at the moment, so it would really be interesting to know so I can compare with my experiences. Really cool data too. 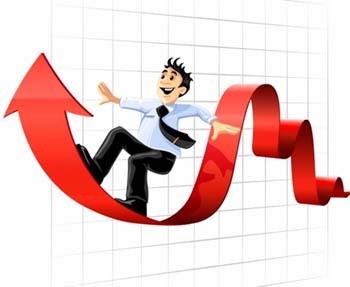 I’m really interested in seeing how you build out and expand your niche sites when you hit one that does well, and maybe a breakdown of income, traffic and rankings by page/article for a big earner like site 1. Future post maybe? Hi Spencer, thank you for sharing, reading your experience is really valuable. One question: if you shoot for around $1 / day for smaller niche-sites, how could that possibly cover hosting and domain fees, and leave a decent profit for you? You don’t have to get a new hosting account for each website. You can host as many as 100 websites on 1 hosting account. So, for around $6/mth you get 100 websites hosted. So, the expenses are not very much. At $1/day its very profitable. Hey Spencer – Any plans to do an update on these sites? 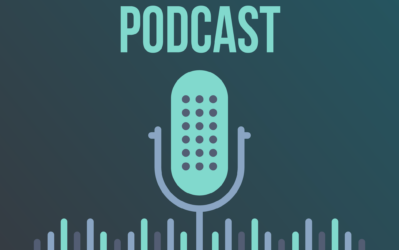 So much has happened in the past couple of months… It would be great to hear how they are doing post-penguin, how you decided to monetize them now that adsense is no longer an option and how their earnings compare. What happened to all your sites? Did they drop out? Old post, but could you give some details about the traffic you get on your sites..? I know I am a little late with this comment but this was a very well written article so I had to say something. I am also in the niche website market and enjoyed reading your income report. Very well done my friend! !